Probably the best looking pub in Leeds interior wise with some interesting looking booths and back bar, ceiling is interesting. Hard to describe it really just worth visiting. I was also impressed with the price, 2.75 a pint is good value in Leeds city centre. I'm not sure if this is a Monday special or not but my impression was not. There were 8 handpull, 7 occupied, by Sharps doom bar, great heck stout, tetley bitter, rudgate brass monkey, Great neck treasure IPA, Bad company Love over gold, Kirkstall Pale ale and Westons Old Rosie. Went for Great Heck stout and it was okay, kept fine but flavour was a bit hit and miss for me. As it's the most impressive pub in Leeds and its well priced then I'll surely be back. Sunday lunchtime visit to this Nicholson’s pub. I’ll come to the interior in a bit. 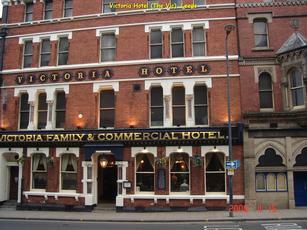 Another Leeds pub that appears in the 2014 GBG so it was a tick that I had do. Very large inside with the main bar to the right as you go through the front door, a long wooden and brass bar appears to your left and offers 9 hand pumps that on my visit were serving 6 different ales. My choice was Black Sheep’s Monty Pythons Holy Grail @ 4%. A very decent pint poured and topped up without asking by the friendly bar man. As with all Nicholson’s pub there was the board up on the wall showcasing the up and coming ales. Very ornate interior, coving, ceiling & hanging lights are lovely but the huge fireplace in the main bar as you enter is stunning, it’s a real talking point and should always be preserved. Quiet on the Sunday lunchtime I visited, just 2 other punters who both ordered food, definitely worth another visit soon....really attractive pub with a good range of ales. I’d like to come back at a busier time. Nothing I didn't like about this jewel. The St Peter's Mild was lovely; the bar is ravishing; the booths are great for small groups; the service was quick and cheerful; and the tasty food was reasonably priced. Now 100% Nicholson branded but stillnothing taken away from its uniqueness. The old place seems to have upped its game on service and so was back towards its best. A bit strange no TT in but a decent range of local ales and some from further afield.